It's 11:20 p.m., and agent Jack Bauer has had a very long day. In the morning, he worked to rescue the secretary of defense and his daughter (who also happens to be Bauer's girlfriend) from a terrorist kidnapping and Web- telecast execution. The afternoon was mostly spent unraveling a plot to melt down all of the nation's 104 nuclear reactors simultaneously. In his spare moments, Bauer shot a suspect during interrogation, held up a convenience store, turned a terrorist wife against her terrorist husband, had a shoot-out with a troop of corporate mercenaries, offered himself up as a hostage, killed an assassin posing as an FBI agent, and tortured his girlfriend's estranged husband for information--only to discover he didn't have any. (How awkward.) But no time for regrets. Air Force One has just been shot down by a stolen stealth fighter, and terrorists are on their way to retrieve the presidential nuclear codes from the wreckage, unless Bauer can get their first. "Right now, this country is under attack," he explains, as he choppers his way to the crash site, "and I've got a job to do." So goes another day at the office on "24," Fox's breakout anti-terrorism action-drama. Now wrapping up its fifth season, the show plays like a breakneck rundown of Richard Clarke's apocalyptic nightmares: loose nukes, weaponized viruses, nerve gas attacks, assassination attempts, government conspiracies, terrorist cells and subcells. For those not yet on the edge of their seats, the urgency of these threats is further upped by "24"'s signature gimmick: The show takes place in "real time," with each episode constituting one hour-- complete with ticking clock bracketing commercial breaks--and each season adding up to a single, frenzied, 24-hour day. Every era has its defining TV shows--popular fictions that, sometimes unintentionally, capture the temper of the times. The first half of the 1970s had the anti-traditionalist agitprop of "All in the Family"; the latter half, the traditionalist nostalgia of "Happy Days." In the 1980s, the crass, extraction-based wealth that we frowned upon in "Dallas" eventually gave way to the sleek, talent-based wealth we aspired to in "L.A. Law." The early '90s were captured by "Seinfeld," a show famously (and, as we would learn only later, blessedly) "about nothing." Then, as Bill Clinton's presidency sank into scandal and ushered in George W. Bush's, "The West Wing" epitomized the liberal flight from reality into a rosier universe where the Man from Hope kept it in his pants. Initially, "24" seemed destined to miss its cultural moment--not by being irrelevant, but by being too relevant. The show's first half-dozen episodes were shot in the spring and summer of 2001 but didn't air until early November, eight weeks after the reality of September 11 had superseded their fictions. At first, audiences stayed away, not yet prepared to be entertained by tales of terrorism. (It couldn't have helped that the very first episode featured a passenger jet being blown up mid-flight, killing all on board.) But, following this bumpy start, "24" has managed to turn its weekly strip-mining of our national anxieties into gold, garnering fistfuls of awards and ratings to die for. Kiefer Sutherland, who stars as superspy Jack Bauer, just signed a reported $40 million deal to return for three more seasons, which would make him the highest-paid actor in a TV drama. "24" has arguably become the defining entertainment of the political moment, earning accolades from observers as diverse as Frank Rich and Pat Buchanan. Rolling Stone just declared it the "central moral-political drama of our time." Like any cultural phenomenon so self-consciously attuned to the zeitgeist, "24" has been widely dissected in efforts to augur the public mood. Conservatives, especially, have been quick to read the show as a political parable, with Bauer's often ruthless methods serving as a flattering proxy for the Bush administration's steadfast, whatever-it-takes posture. The American Spectator has applauded the show's "political and moral toughness"; The Washington Times exulted that it "identifies the terrorist enemy without flinching and lets the good guys fight to win--without apologies." Time's Joe Klein described it, more critically, as "the classic conservative fantasy--the myth of American competence and omnipotence." But, irresistible as it may be for conservatives to claim "24" as a ratification of their post-September 11 worldview, it's not one. This is in part because the show's politics aren't conservative in any meaningful way. But, more importantly, it's because the show is beyond politics altogether--or, perhaps more accurately, beneath them. "24" capitalizes shamelessly on the post- September 11 mood, but, for all its topicality and moral theatrics, it has never really come to terms with post-September 11 reality. American hero Jack Bauer is an ex-swat, ex-Delta Force commando working for the Los Angeles branch of the (fictional) Counter Terrorist Unit (CTU), an elite, high-tech CIA spinoff. As befits his training, he is a man of action: decisive, aggressive, and disinclined to play by the rules when he feels they're getting in the way. He never wavers, second-guesses, or gives in to criticism, instead doing whatever needs to be done to safeguard American lives, regardless of the costs. Conservative fans of the show frequently note the similarities between Bauer's disposition and that of a certain White House resident, and they claim that "24"'s popularity is evidence that, whatever the polls may say, Americans want someone like Bush to defend them in these troubled times. Buchanan has gone as far as to pronounce the president our "Jack Bauer in the war on terror." But the contours of Bauer's character have far less to do with the demands of geopolitics than with the demands of genre. Put simply, the heroes of action films, books, and TV shows are almost always decisive, aggressive, and disinclined to play by the rules. One does not find many of them obsessed with rumination and consensus-building for the same reason that one finds few impetuous he-men in drawing room comedies: It doesn't work dramatically. It is no coincidence that, when political meaning is imputed to iconic action stars-- John Wayne, Clint Eastwood, Arnold Schwarzenegger--that meaning is nearly always "conservative." "24" actually takes this genre requirement one step further by making time itself the essential villain of the series: Individual terrorists come and go, but "24"'s ticking clock remains, counting ominously down toward one cataclysm or another. Little wonder that cautious deliberation is low on the show's checklist of virtues. More fundamentally, those who wish to conflate Bauer and Bush misunderstand that, in heroic fiction--and, for all its tragic trappings, "24" is certainly this--the relationship between character and effect is reversed. Bauer is not a hero because he does whatever is necessary; whatever he does is necessary because he is the hero. When he performs a terrible act--the murder of a witness, the terroristdemanded execution of a CTU colleague--it's always clear that there was no other way to prevent a larger tragedy. Likewise, when he takes the path of mercy, it proves to be the correct one and another, less heartless solution to the dilemma will present itself. Unlike real-life decision-makers in general--and Bush in particular--Bauer has the considerable virtue of always being right. Conservatives also point to Bauer's disturbing affinity for torture as a means to gather information, a trait that, thanks to Abu Ghraib and other recent revelations, is now apparently the undisputed (if perhaps unwanted) property of the GOP. But here, again, the show's purposes seem more narrative than political. Yes, Bauer will on occasion break suspects' fingers, step on their bullet wounds, electrocute them with table-lamp cords, or threaten to mutilate them with knives. But the roster of unfortunates tortured by Bauer and his colleagues is comically improbable. In addition to the familiar litany of low-level thugs, paid assassins, and suspected CTU turncoats, the president of the United States orders (with the show's evident approval) the torture of his national security adviser. The secretary of defense authorizes the torture of his own slacker son. And, of course, Bauer tortures his girlfriend's husband. Perversely, when the villainous masterminds at the center of "24"'s plots are captured, they are as often as not spared the graphic, extended punishment that the show otherwise metes out so promiscuously. The story offers reasons, of course: There isn't time, the bad guy is too tough to crack. But another underlying explanation for this reversal--in which people who would never be tortured are, and those who almost certainly would be aren't--is that the decision to torture someone known to be planning mass murder is relatively easy; the decision to torture the national security adviser or your girlfriend's hubby is so much more morally anguished, an opportunity, however implausible, for the show to advertise its hardheartedness. "We're not political," co-creator Joel Surnow recently explained. "But what we are is, we're hard-core." Ultimately, the purpose of "24"'s systematic abuses of the flesh (as well as the often brutal deaths of characters both good and bad) is less to explore the justifiability of violence than to lend an air of realism and moral gravity to what is otherwise a cartoonish view of the war on terrorism. We live in an age when grittiness is frequently mistaken for truth, when a dark view of human nature is presumed to be an accurate one. As the Los Angeles Times recently noted of TV dramas, "death becomes a measure of a show's authenticity." With that currency, "24" can afford to purchase an awful lot of authenticity. There are other details occasionally thrown out to support the idea that "24" is a conservative critique of our times, but they're less convincing still. Yes, there have been characters on the show who seem hatched from an Ann Coulter fever dream: a terrorist-coddling lawyer from "Amnesty Global" who prevents a much-needed interrogation; the secretary of defense's petulant lefty son, who has to be chided for his "sixth-grade, Michael Moore logic," et cetera. But their population is dwarfed, in both number and significance, by the cast of liberal bugaboos: the shadowy businessmen who nefariously appear to pull the strings of more than one president; the vice president so eager to start a war in the Middle East that he uses the Twenty-Fifth Amendment to remove the more cautious president; and so on. It's also hard to imagine it a coincidence that David Palmer, the wise, stalwart, honest president of the early seasons, is a Democrat, and that the Republicans who succeed him are a scandalmonger and a Nixonesque weasel who ultimately proves to be at the center of a conspiracy to manufacture evidence that will enable the deployment of U.S. forces abroad. "24" may swing right more often than such one-sided liberal wish-fulfillments as "The West Wing" and "Commander in Chief," but, on balance, its schizophrenic mix of political provocations still leans to the left. Nonetheless, Frank Rich may want to hold off on that victory lap. Ultimately, the world that "24" envisions each week is less liberal or conservative than it is one from which political belief has been banished altogether. We're introduced to a strong Democratic president and a weak Republican one, but neither is, for example, recognizably hawkish or dovish with any consistency. The former sometimes demonstrates his strength through aggressive action (e.g., illegally detaining a journalist who might reveal a terrorist threat to the public) and sometimes through thoughtful restraint (resisting his vice president's war preparations). Likewise, the latter's weakness initially makes him appear overly cautious; only later do we learn he is behind a nefarious secret plot to extend U.S. hegemony in Central Asia. Character is everything; ideology, nothing. Indeed, the entire show takes place in a peculiar political vacuum: September 11 appears to have happened (there's at least one reference to "GuantAnamo"), but there's no sign of Al Qaeda or the war in Iraq. Only two of the show's five seasons feature jihadist foes, and, in one case, they're the unwitting pawns of an American oil company exec. The rest of the time, the nation's safety is menaced by vengeful Serbs, Chechen separatists (again, caught up in a U.S. plot of which they know nothing), and a pissed-off ex- member of the British special forces. It's an odd but effective bait-and- switch: Though "24" trades upon post-September 11 anxieties for its sense of urgency and moral purpose, the world in which it takes place seems almost entirely untouched by September 11. This contradiction between intended message and actual one extends to "24"'s underlying moral philosophy as well. The central mythos of the show is that Bauer is a superhuman patriot who will sacrifice anything for the good of the country. Except, of course, when he doesn't. In the very first season, Bauer is forced to weigh two conflicting duties: preventing terrorists from assassinating presidential candidate Palmer, on the one hand, and protecting the lives of his wife and daughter, whom the terrorists have taken hostage, on the other. And, far from privileging the former duty, Bauer repeatedly undermines Palmer's safety in his effort to keep his own loved ones alive. (His wife dies at the end of the season anyway, but he couldn't have prevented it.) One could argue that this elevation of the private over the public was appropriate in the first season, with its pre-September 11 origin and a terrorist plot that threatened only the life of a presidential candidate. But, as the stakes rise exponentially in subsequent seasons, the pattern repeats itself: Bauer's loved ones fall into harm's way in the midst of terrorist crises, and he does whatever it takes to save them--disobeying orders, diverting CTU resources, even jeopardizing national security. Bauer is not alone. The question of public versus private duty is raised most explicitly in the third season, when the virus-wielding terrorist Stephen Saunders captures Michelle Dessler, the wife of CTU agent Tony Almeida. Saunders demands that Almeida allow him to escape a CTU siege or he will kill Dessler. Almeida saves his wife's life, but, in the process, endangers millions of others. And, while he is briefly imprisoned for treason, the show leaves no doubt that he did the right thing. As Bauer himself argues, citing Almeida's earlier work, "You should be putting a medal on him, not handcuffs." Of course, in all of these cases, everything works out: The loved one is saved, and the threat to the public is nonetheless averted. That is not necessarily so, however, when a CTU character takes the opposite course and prioritizes patriotic duty over familial love. In season four, then- CTU chief Erin Driscoll is trying to juggle her job and her emotionally unstable young daughter, who is being cared for in the CTU infirmary. At just the moment Driscoll is scrambling to override the meltdowns of several nuclear reactors, the infirmary calls. Driscoll says it will have to wait. But when she arrives at the infirmary barely two minutes later, her daughter is dead, having somehow managed to slit her wrists right under the doctors' noses. It's hard to miss the point here: When your private and public obligations come into conflict, pay attention to the former. Luckily, the terrorists also seem to prize the personal over the political. A series of otherwise ruthless, fanatical killers give up when Bauer threatens their children. Indeed, it frequently turns out that even the motives that lead the show's villains to attack the United States in the first place are more individual than ideological. The main baddie of the first season is a Serbian warlord who targets Bauer and Palmer because of their roles in a botched covert operation to take him down. In season three, Saunders's viral scheming is due to his bitterness at having been left behind by Bauer on that very same Balkan mission. And, in season five, a former CTU agent's involvement in the president's conspiracy is due in part to Bauer's having drummed him out of the agency for corruption. It all raises the possibility that Bauer could best safeguard the United States by moving elsewhere and bringing his collection of vendettas with him. "24" is clever entertainment--riveting and occasionally thought-provoking. Is it the "central moral-political drama of our time"? Hardly. 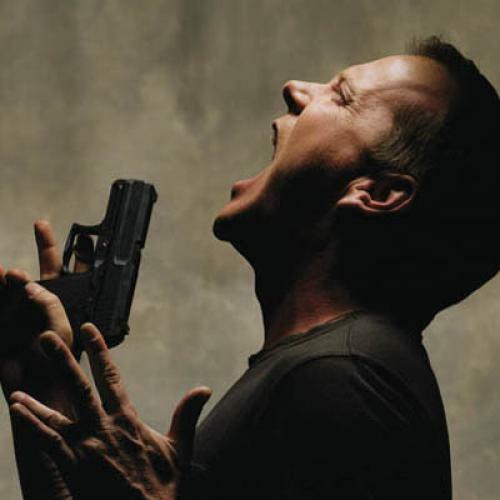 But, even if the saga of Jack Bauer is not a serious commentary on this anxious moment in American history, it does reveal a great deal about the seriousness of a culture that could mistake it for one. After September 11, there was much talk of how we as a nation were going to shed our innocence and enter an age of greater common purpose, in which politics would cease to be petty and irony would be extinguished. Obviously, it didn't work out that way. The attacks wounded the American psyche, but they had precious little impact on American life. Though we pay lip service to the enormity of the attacks, we still drive the same cars and watch the same silly TV shows and engage in the same partisan squabbles. "24" is, in some ways, the perfect cultural artifact for this post-September 11 moment. It extols patriotism but doesn't quite believe in it, preaches a self-sacrifice it practices only intermittently, and offers up a world in which the choices are always impossible but the answers are always right. On the surface, it flatters our belief that we're better now, more stoic and unselfish, committed to ideals larger than our individual wants and needs. But, below, it reassures us that it's OK to place our own households first, that politics is empty if not actively corrupt, and that belief in a cause will only lead to disillusion or betrayal. It's been four and a half years since "24" first stepped out into the unexpected shadow of a national tragedy. But it remains to this day what it was from the beginning--the orphan of a more frivolous age, trying hard to prove it is tough and serious enough for the rigors of a post-September 11 world. Just like the rest of us. Christopher is a Senior Editor at The Atlantic.